From Main body of report: Deceased and some others had pushed forward a loaded truck, which buffered against and set in motion another truck which stood upon the table of a weighing machine. Deceased and one or two others followed the latter to keep it in motion. It was stopped by a piece of wood which lay across the rail, and recoiled, when deceased's right arm was caught between the buffers of the two trucks and broken at two places above the elbow. This accident happened on the 19th September 1894, it was reported as a non-fatal accident and investigated. Death ensued after the investigation but was not intimated to me as it should have been, and I was not aware of the fatal termination in time to include it in the list of fatal accidents for 1894. From Main body of report: This accident occurred on a dook road in the Splint coal seam. The road dipped 1 in 7.3 on an average, and was 530 yards in length. The system of haulage was by a single rope, the empty rake of tubs taking down the rope. The deceased was employed as a miner, and when work was over for the day he and his son were proceeding up the dook on their way home; a loaded rake passed them, and deceased attempted to get on to it for the purpose of riding to the top; he got on the coupling-chain between two tubs, his hand slipped, and his body came in contact with & prop with such force that it was knocked out. The injuries received were such that he succumbed to them seven hours later. The rake consisted of eight tubs, and the speed was about three miles an hour. Deceased had not received permission to ride on the rake. From Main body of report: Deceased was bottomer at a mid-working, where one side of the shaft was fenced by a malleable-iron gate sliding vertically on guide rods, and raised by means of a lever to which it was attached by a chain which passed over a pulley. Something having gone wrong with the chain at the pulley, deceased leant over the gate to put it right, and appeared to have been struck by the descending cage. He received a severe scalp wound, from the effects of which he died on 5th November. From Main body of report: Deceased was employed as a labourer on the surface, and his duties were to riddle and then wheel ground blaes in a barrow to waggons, a distance of 7 yards from the pan. While tipping a barrow load of the blaes from a plank placed across a waggon, he overbalanced himself and fell to the ground a distance of 7 feet, injuring his head and spine, to which injuries he succumbed three days later. From Main body of report: Deceased was scalded by falling into a tank containing brine, and heated by steam to a temperature of 205° F. The tank is situated near the Leven Colliery, and is used for the purpose of impregnating mining timber with salt, so as to preserve it from decay. Deceased was employed in connexion with this operation, and while removing timber from the tank he slipped in and was scalded about the legs. He removed the timber by striking a pick into it and then hauling it out by means of the pick handle, and it was when striking at a log that he fell in. He died 15 days after the accident. 1895 February 9 10am 5th East Plean Coal Stirling Merryton Coal Co James Newlands Miner 44 Falls of side Fall of coal and stone. From Main body of report: This was a boiler explosion causing the loss of two lives, one a fireman employed by the owners of the colliery and the other a tramp, who happened to be in one of the fireholes at the time. A second fireman was injured but not seriously. The explosion caused much damage to property about the colliery and was the subject of a Formal Investigation by two commissioners appointed by the Board of Trade, whose report dated the 22nd April, has been published. I visited the colliery on the day of the explosion and then, and subsequently made examination into the matter, also attending the Formal Investigation. I do not propose giving all the details which are recorded in the Board of Trade Report but will only notice some features of the accident. Six egg-ended boilers comprised the range and were of the usual construction, and had the usual fittings and were flash flued. They were all connected. No. 1 boiler played no part in the explosion. No. 2 boiler was displaced and thrown over No. 1; its chimney end was found nearest the fire-holes; it lay on its side over No. 1. It had been raised from its place and turned over on its longitudinal axis and moved to one side. There was a fracture extending into two plates of the second ring from the chimney end at the bottom of this boiler and directly under the feed pipe; this fracture crossed a longitudinal seam, it was about 4 feet long and was evidently caused by pressure from within, as the edges of the fractured plates projected outwards. No. 3 boiler was fractured right round the second seam from the chimney end an$ the two parts projected some distance. No. 4 boiler was similarly fractured round the third seam and the two parts blown either way. Nos. 5 and 6 boilers played no part in the explosion. The boilers were supported by rackets and brick pillars. There was no evidence of (1) want of water, (2) overpressure, (3) thinning of plates. Two theories to account for the explosion were placed before the Court: (1.) The theory of the Board of Trade Inspectors that No. 2 boiler had given way at the plates already described and allowed water, to rush, out with great force and destroy the brick supports of No 3 boiler casing it and No 4 boiler to explode. (2.) The theory of Mr. Munro, engineer of the Scottish Boiler Insurance Company, that there had been a latent flaw in No. 3 boiler at the point where the fracture occurred and that this boiler exploded first. The commissioners rejected both these theories and concluded that No. 3 boiler exploded owing to its brick supports becoming wasted. I incline to the view taken by the Board of Trade inspectors with some modification. The position of No. 2 boiler after the explosion considered in conjunction with the position of the fracture of the plates on its underside is worth consideration. It appears to me more probable that this fracture preceded the explosion than was caused by it. If it preceded the explosion it appears possible that a sudden rush of heated water into a hot flue might develop a momentary pressure sufficient to lift this boiler and cause it to assume the position in which it was found. The sudden strain put upon the adjoining No. 3 boiler caused it to give way, and in turn No. 4 gave way. The commissioners attached a small degree of blame to the colliery owners; they state: We are not satisfied that sufficient precautions were taken by the owners to secure that the boilers were kept in good and proper working order. It was proved that the requirements of the Coal Mines Acts and Special Rules founded thereon with regard to steam boilers were carried out, and in addition a mechanical engineer was employed by the owners to look after the machinery although he had no special charge of the boilers. The exploded boilers were also insured and inspected by a boiler insurance company. This finding indicated that the commissioners were not satisfied with an amount of supervision such as holds good with regard to nearly all the colliery boilers in the district. From Main body of report: Deceased and his brother were engaged in sinking a shallow pit from a coal seam to a stone mine below; in the pit, which was only about 3 1/2 feet deep they bored two holes and charged them with blasting gelatine; both holes were ready to fire at once, and the brothers each lit the fuze of a shot and retired with a miner, who was working the coal near the pit, to a place of safety ; one shot exploded, and after waiting about 1 1/2 minutes, deceased, unknown to his brother and the miner, returned to the pit and was either in it or getting into it when the second shot exploded, inflicting such injuries on him as caused his death three days after. Deceased apparently thought that (1) both shots had-gone off simultaneously, or (2) one had missed fire; in either case he made too hurried a return. The practice of lighting two shots together is often attended with accident. From Main body of report: Deceased was employed as night-shift screenman. He had been on the pithead scaffold speaking to the pitheadman, and when returning to his screen, instead of descending by a trap stair provided for the purpose, he slid down the upper screen, and was carried forward by the picking-table. As he passed over its end, he placed his right heel upon the upper edge of the dumb-plate, when it was caught by one of the plates of the picking-table, and his leg was drawn through a space 2 1/2 inches in width. He sustained compound fractures above the ankle and above the knee, and his leg was severely lacerated. He succumbed two days afterwards. From Main body of report: This accident occurred in one of the few circular shafts in the district. Deceased fell down the shaft from the cage from an upper to a lower seam. The shaft is 11 feet in diameter and passes through the Main coal at 126 fathoms, and the Splint coal at 139 fathoms; two cages traverse it, one running to the Main coal only and the other to the Splint; the drum of the winding-engine is of two diameters to suit the respective depths. The Splint coal cage was not used for raising mineral from the Main coal, and when this cage was at that seam there was an open space between each end of the cage and the circle of the shaft. Although the Splint coal cage was not used for raising mineral from the Main coal seam, it was occasionally used by the officials when they required to descend from the upper to the lower seam, and it was an occasion of this kind that led to the accident. Deceased and three other persons got on to the cage to descend to the Splint coal, and they had reason to believe that the first stop would be at that seam, as four persons was the maximum number allowed on the cage by the special rules, and therefore no person could have got on to it at the Main coal. An oversman, however, wished to descend from the Main to the Splint coal, and while the cages were running in the shaft he instructed the bottomer at the Main coal to signal to the engineman to stop the cage at that seam, the bottomer did so, and in order to warn any persons who might be on the cage, he leant forward as the cage approached and cried to them to keep on; some of the men on the cage heard this warning, but deceased, who was on the side of the cage opposite to the bottomer, apparently had not heard it, and probably thought he had reached the Splint coal when the cage stopped and seems to have stepped off the cage and fallen down the shaft through the space already described. The Main coal was lit by four hanging safety-lamps and the bottomer there had also a safety-lamp in his hand. Deceased had only worked in the Splint coal,for two or three days before the accident. A blind pit close at hand provided with ladders afforded a means of reaching the Splint coal from the Main coal. The practice of stopping a descending cage of men at an upper seam where the shaft is open is a dangerous one and has been discontinued in this case. 1895 March 19 Earnock Lanark John Watson Ltd Andrew Lewes Railway guard 35 Deaths not classified under Coal Mines Regulations Act Crushed by wagons. Employed by Caledonian Railway Co.
From Main body of report: A mineral guard employed by the Caledonian Railway Company was injured while shunting wagons on the sidings of Earnock Colliery, and subsequently died. I had some doubt as to whether or not this case should be classed as a mining accident, as deceased was at the time of the accident engaged in work at the colliery, but on inquiry I found that the accident had been reported by the railway company as a railway accident, and will appear in the Board of Trade returns as such. 1895 March 21 10pm 4th Newton No 2 Pit Coal Lanark James Dunlop & Co Ltd Alexander Bell Brusher 22 Miscellaneous accidents underground Explosion of compressed gunpowder while putting it into a shot-hole Newspaper report?? From Main body of report: Deceased was employed as an engineman, and had charge of a winding and haulage engine, both in the same house. The haulage engine was of the horizontal type with a cylinder 9 inches diameter and geared 53 to 1. It was used for hauling coal up a dook in the Virtuewell coal; the speed of the empty rake in descending the dook was regulated by a brake on the drum. This brake consisted of a strap of hoop iron 3 inches broad which pressed on almost the whole surface of the brake flange. Deceased had set the haulage engine in motion to draw a rake up the dook. Shortly after an unusual noise was heard proceeding from the engine-house and on entering it deceased was found among the gearing terribly injured, and expired as he was released. The haulage engine was still in motion; the rope had broken away front the rake and been wound up the shaft, and the noise that had been heard was caused by the chain at its extremity striking the engine-house as it revolved. It is supposed that the brake gave way while the engine was in motion, and the handle striking deceased on the head .threw him in among the wheels, but how this happened there was no evidence to show. The tensile strain to break the strap and handle was great, as the part broken showed a ragged surface indicating a tear, and there did not appear to be any defect in the material. There was an iron fence round the engine and this was broken down. From Main body of report: This accident was of a sad nature. A box containing a large dynamo for electric machinery and weighing about 4 1/2 tons, was being removed from a waggon by means of a screw jack, which raised the box and pushed it along horizontally on a prepared track. Deceased, the manager of the colliery, was superintending the work and went under the box to work the screw jack. As soon as the box was raised a short distance, it canted and one end fell on him and crushed him so severely that he died three hours after. The screw-jack although acting on the centre of the box was not acting on the centre of gravity and as soon as it was raised off the planks at one end it fell over sideways. From Main body of report: The body of a man whose name I could not ascertain was found in the shaft of Vogrie Colliery : how he got there there was no evidence to show, it appeared probable that he had committed suicide. The shaft top was properly fenced. From Main body of report: These brushers with several others had gone down the shaft to commence work, taking with them about 21 lbs. of gunpowder in six canisters, and were congregated about the tool-house near the pit bottom when, in some unexplained way, the contents of four of the canisters, amounting to some 14 lbs., exploded. It is conjectured that one of the canisters had been opened, and that a spark from a lamp or a pipe fell into it. From Main body of report: This accident was caused by a rope which was being wound up the shaft with no burden attached, and provided with an appliance known as " sinker's grip," dislodging a plank from the side of the pit. The sinker's grip was attached to the rope so as to afford the sinkers standing on the rim of the kettle something to hold on by better than grasping the chain. Fig. 1 shows the appliance which was altered to Fig. 2 after the accident. The pit was 74 fathoms deep, and the plank which was 7 ft. 4 in. by 9 in. by 3 in., was nailed to the side of the shaft at a point 27 fathoms from the surface. The plank supported a pipe. It would appear that the rope while being wound up the shaft had been swinging, and the upper surface of the grip caught the under surface of the plank tearing it from its place, the plank fell to the bottom and injured one of the sinkers so severely as to cause his death about three weeks after the accident. From Main body of report: The foreman of a coal-washing machine lost his life in a large dross hopper, three sides of which lined with sheet iron sloped to the outlet hole in the bottom. The dross sometimes adhered to the sides and did not run freely, and deceased had gone to the bottom of the hopper with a shovel, and began to clear away the dross. This relieved the body of dross lying above him, which came down with a rush and suffocated him. From Main body of report: Deceased was setting some pieces of shale in a truck which was nearly full, when a loaded tub was, brought forward to be tipped. The runner shouted to the men in the truck to "look up.'' Decease called to him to hold on, and at the same, time tried to leap towards the end of the truck to get out of the way. Probably owing to his being hurried,.he slipped and fell backwards upon an angular piece of shale, which fractured his spine. He died three days afterwards. From Main body of report: Deceased was driving a road through a barrier of ironstone which separated two sections of longwall workings, and which was about 90 feet in width. The road was about 4 feet in width by about 3 feet in height, but as part of the debris was spread along it to save drawing it to the surface, the average clear height was reduced to about 1 foot 6 inches. At the date of the accident the road had been driven for a distance of about 60 feat. No provision was made for taking in air from the longwall face. Deceased commenced work shortly after 6 am. At 9.15 am he fired a shot and retired to the longwall face, where he took breakfast. It is not known when he returned to the working face, but at 10.15am a miner who was working down from the other side of the barrier to meet him heard him chap on the strata, and make a pre-arranged signal that he was leaving off work for the day. About two hours afterwards the fireman visited the place. About half-way in the narrow drift he found a lamp burning, on passing which his own lamp was at once extinguished. He took up the spare lamp, which contained some paraffin oil, proceeded inwards, and found deceased lying about 12 feet from the face. He was quite dead, and his lamp, which lay beside him, had been extinguished. Death had apparently been due to asphyxia. From Main body of report: Deceased was shifting a truck which had been loaded with ironstone. He ran an empty truck against it to set it in motion and then running after the loaded one, he attempted to insert a snibble in the right leading wheel. The point of the snibble was caught by a spoke of the wheel, and twisted against the. wheel guard ; the outer end of the snibble was jerked violently backwards, striking deceased and knocking him in front of the rear wheel which passed over both of his legs nearly severing them from his body. He died about 15 minutes afterwards. From Main body of report: Deceased and three others were descending the shaft to commence their shift at a landing or mid-working situated at a depth of about 30 fathoms. When the cage stopped at the landing two of the men stepped off; as the third was following them the cage began to ascend slowly, and as deceased was stepping off, it tilted him forward upon the plates, his legs swung past the cage bottom, and he fell to the bottom of the shaft, a distance of about 43 fathoms, and was killed instantaneously. The shaft was one of two which were situated about 40 yards apart. One was a pumping pit, and was used only by the officials, and when required. The winding pit was fitted with coupled horizontal engines having 18 in. cylinders and 10 ft. drams. Only one rope and cage were in use; consequently the load was unbalanced. There were no shuts at the mid-working. The signalling apparatus appeared to be in perfect order, and the shaft was fenced at the mid-working by a gate, sliding vertically, and connected by a wire to an indicator in the engine house. While the cage containing the four men was being lowered, a messenger entered the engine-house, to inform the engineman that the overman, who was attending to the pumps in the pumping shaft, was signalling to be drawn up. He waited until the engineman had set the cage at the landing, then delivered his message, and was told by the engineman that he could not leave his engine until the cage had been signalled away by the bottomer. While he was speaking the bell rang one stroke. He then raised the cage about half way to pit mouth, shut off steam, pinned down his brake, and went over to the pumping pit to draw the overman. As he was leaving the winding engine-house the bell rang two strokes, and immediately afterwards some one was heard shouting up the shaft that a man had fallen down. The bottomer, fireman, and the three men who had left the cage agreed that no one at the landing had touched the signal lever prior to the accident, and from their positions relative to it, it appeared to be highly improbable that they could have done so. The bottomer and fireman saw the cage beginning to rise before deceased had left it, and on seeing him fall the fireman sprang to the lever and signalled one stroke to stop the cage. As it appeared to continue its ascent, he then signalled two strokes, and shortly afterwards shouted to inform the pitheadman of the accident. Several persons on pithead distinctly heard the signal bell strike one, and shortly afterwards strike two; but no one heard it strike one twice as they must have done had it been first rung inadvertently, and then rung by the fireman to stop the cage. The accident may have been caused by the engineman having checked the engines with steam during the descent of the unbalanced cage, and having unconsciously reversed the engines and eased the brake while listening to the message from the pumping pit. The elastic force of the steam shut in the cylinders might be sufficient to move the pistons a few inches as the cage was relieved of its load; and the single stroke of the bell which the engineman took to be the bottomer's signal to raise the cage, was probably the fireman's signal to stop it. Assuming, however, that this was the cause of the accident, the engineman appeared to have contravened Additional Special Rule No. 2 in respect that be moved the cage from the mid-working while the gate fencing the shaft was open. He was tried for this contravention and on pleading guilty was admonished. From Main body of report: Deceased, a day or two before the accident was placed in charge of a capstan used for bringing forward loaded wagons of dross to a coal washing machine. He was instructed how to proceed. The capstan was connected with the machinery which worked the washer and made about 50 revolutions per minute. A hemp rope was passed round it twice, one end was provided with a hook which was hooked on to the wagon and the other end was free, the person in charge by pulling at the free end caused the rope to grip the capstan and so moved the wagon. It appeared that deceased stood in a wrong position and by some means the rope which had passed round the capstan became entangled in the rope that was passing round it and deceased was drawn in and carried round. The engine working the whole plant was stopped and deceased extricated. It was suggested at the public inquiry that a clutch should be provided so that the person in charge of the capstan could stop it revolving without the washery engine having to be stopped which was some little distance away. 1895 July 30 8.30pm 3rd Redburn No 1 Pit Coal Ayr William Baird & Co Ltd Alexander Bennet Brusher 52 Falls of roof Fall of roof at brushing face. 1895 August 14 6.15am 1st Straiton Oil shale Edinburgh Clippens Oil Co Ltd Robert Stenhouse Miner 23 Explosions of fire damp or coal dust Ignition of fire-damp by naked lightFrom Main body of report: This accident took place at the face of an upset in a section of the Dunnet oil shale seam. The seam gives off gas, generally in small quantities. The section was originally formed into stoops, and these having become crushed, the shale was being worked away by the longwall method. Deceased went to his work as usual with his open lamp on his cap, and on reaching the face gas was ignited by it, and an explosion resulted. He succumbed to his injuries within two days of the accident. The accumulation of gas appeared to have been small, as the explosion was slight. The miners working 20 yards away heard no report, nor were their lights extinguished. The roof had fallen along the left side of the place some days prior to the accident. A small quantity of gas was seen in the place three weeks before the accident, but was not seen again until five days after. On that day Mr. M'Laren, one of the Inspectors assisting in the district, discovered gas near where it was supposed deceased had kindled it. The fireman's date was found on the face opposite the road, or spout head, showing he had been in the place, but whether he examined the fallen side along the face was not very clear. The means of ventilating the left side of the place where the roof was fallen, and where probably the gas accumulated, was not satisfactory, as the air-current, after passing along the right side of the place, went down the spout. It transpired that the fireman, when examining the place before the entry of the miners, as required by General Rule 4, did so more than two hours before the commencement of the shift, which is the time fixed by Special Rule 9 within which the examination must be made. From Main body of report: Deceased was employed as a general labourer, but, when the accident took place, was assisting at the screen. A truck having been loaded, he called up to the pitheadman to get it shifted. The latter being engaged unloading the cage could not come at the moment, and rather than wait for him, deceased proceeded to shift the truck himself. While doing so he was caught and crushed between the axle box of the truck and a side stay which supported the trimming shed, sustaining injuries which resulted fatally two days afterwards. From Main body of report: A wooden slide about 30 feet long and weighing about 2 3/4 cwt was being raised by means of a hemp rope passing over a block fixed to the pithead frame. Four men, including deceased, were pulling at the rope attached to one end of the slide, the other end resting on the pithead scaffold. The slide came in contact with the underside of a cross-beam, the rope broke, the slide fell on to the pithead and struck deceased on the head inflicting injuries that caused his death two days later. The manager of the mine could give no history of the rope beyond that it had been in use for some time. The rope was of hemp and was hawser laid, it was 1 inch in diameter; the breaking strain when new would be 85 cwt., the proof strain, 34 cwt., and the safe working load, 8 cwt. It was in fairly good condition but somewhat worn. It was stated by a practical rope maker at the inquiry that it was a tarred rope, and that the tar burns the hemp in the course of time, and that three years would be a fair lifetime for such a rope. The pulley on the block over which the rope passed had a piece broken off exposing rugged edges, but not, I think, likely to cut the rope. It appeared that the rope had deteriorated in quality and was not safe to use. From Main body of report: A bottomer fell along with a loaded hutch from a mid-working and received fatal injuries. He was alone at the time, and had opened the gate fencing the shaft when the cage was at the surface, and while the engineman was attending to the boilers. From the fact that he was found in the pit bottom along with a full hutch it is evident that he was under the impression that the cage had been at the mid-working. Accidents of this description, at one time of frequent occurrence, ought not to happen now if the recently established special rules are properly observed. The shaft at a mid-working, ought also to be always well lighted. From Main body of report: This accident occurred in the same pit, and was very similar to No. 46. [August 7] Deceased, who was a horsedriver, had gone inbye with a set of empty tubs, and stood at the foot of a cut chain brae waiting for a tub to complete the loaded set. The brae was about 50 yards in length, and had an inclination of about 1 in 3. The chain broke at a clasp link, exactly similar to that described in connexion with No. 46, one end of one of the rivets having in this instance been pulled through the hole in the side plate. The empty tub ran back and struck deceased, inflicting injuries which resulted in his death a fortnight afterwards. The only witness of the accident was the hanger-on, who appeared to have contravened Special Rule 81, in respect that he failed to prevent deceased from approaching the brae while the hutches were in motion. 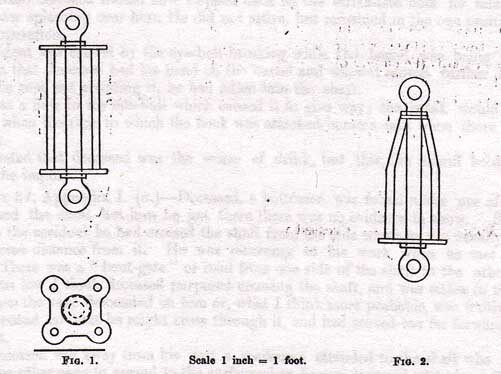 Clasp links are used in these chains for the insertion of the " cut links" and their attachments, and also on account of the frequent extensions of the braes necessitating the lengthening of the chains. The form above described does not appear to be the best which can be adopted. The holes in the side plates being simply punched, have more or less of a taper; and the rivetting being done underground may sometimes be imperfect. If rivetted too tightly, the link becomes too rigid to run easily round the pulleys, and as their heads become worn by rubbing along the rough pavement, the rivets bend and are pulled through. : The owners have since adopted an improved form. From Main body of report: The seam of limestone in which this accident occurred is about 11 feet in thickness, and is divided into plies of from 2 to 3 feet. The partings between these plies are rough and somewhat irregular, but the backs or joints by which the limestone is intersected are more or less regular, nearly vertical, and frequently coated with clay. The two lower plies of limestone had been taken out in a place 15 feet in width. A shearing shot had been fired, which brought down a portion of the third ply, and shook the limestone adjoining it. Some effort had been made to pinch down the loosened limestone, but as this failed, the miner was about to drill a shot-hole in it. Deceased went under the nose to pick up a piece of limestone, when a block measuring 5 feet 2 inches by 2 feet 6 inches by 2 feet 3 inches suddenly fell upon him crushing him so severely that he died some hours afterwards. 1895 November 5 10pm 2nd Tannochside No 2 Pit Coal Lanark Calderbank Steel & Coal Co Ltd Michael Doran Brusher 25 Explosions of fire damp or coal dust Explosion of fire damp. The cause was not ascertained, but it is supposed he must have exposed a naked light instead of using his safety lamp. From Main body of report: The second fatal explosion happened in No. 2 Pit, Tannochside, where safety lamps were in use. The deceased, a contractor brusher, was alone at the time, having for some unknown purpose gone into the working place of a miner where his duty did not require him to be. His statement after the accident was to the effect that while he was at the coal face the roof gave way and fell upon his safety-lamp and broke the glass, when the explosion took place. Another brusher who was working not far off stated at the inquiry that, on entering the place shortly after, he found the Marsant safety-lamp lying extinguished on its side about 3 feet clear of the fall and having the glass cracked. On the other hand, the sworn evidence of the fireman was to the effect that when he met the deceased and the other brusher both of their lamps were burning, although the glass of the lamp of the former was cracked. It is obvious that if the lamp of the deceased was afterwards found burning, it must either have been illegally lighted after the explosion or the statement that it was found lying on its side extinguished was untrue. I am inclined to believe that the deceased must have been illegally exposing a naked light of some kind, and that it came in contact with an accumulation of gas. 1895 November 6 10.15pm 5th Kenmuirhill No 2 Pit Coal Lanark Dunn Brothers John Muir Engineman 36 Shaft Accidents Fell down the shaft from the surface, having apparently supposed that a scaffold which had been previously been across it was still there. From Main body of report: This accident was of a simple nature. The boy was a driver between an inside lye in the Main coal, and the main lye at the bottom of a haulage dook. On the morning of the accident, while behind some horses attempting to drive them through water lying in the main lye, he struck the last horse with a whip, which caused it to kick out and he was struck on the face. He succumbed to the injury two days later. The water had accumulated in the lye through a pump being off for repairs. From Main body of report: This accident was caused by deceased, who was supposed to have been cleaning a drain crossing a line of rails, being crushed between an empty wagon and a wagon partly loaded with peas; these wagons collided owing to the empty wagon being sent forward by some wagons loaded with dross striking it. The persons lowering the dross wagons were unaware of deceased's position, and it appeared that deceased should not have been where he was. 1895 December 10 12.30pm 6th Craighead No 2 Pit Coal Lanark William Baird & Co Ltd David Harper Chain runner 18 Miscellaneous accidents underground While opening a door on a dook, he was crushed against it by a race of hutches of which he had charge. From Main body of report: Deceased was assisting another man to repair a broken electric cable, on a dook which had a dip of about 1 in 6. About 50 yards further up the dook, four men, under the direction of the manager, were bringing down a tub containing about 3 cwts. of coal and having a broken drawbar, with the intention of turning it aside at an old road end. The tub was not snibbled, and the men allowed it to overpower them, and to get away. They shouted to warn deceased, who ran towards a manhole about 5 yards above him, but was struck by the tub and killed on the spot. His neighbour reached a manhole 10 feet below where they were at work, and escaped.